It seems I've posted new central listings with the Ocean Independence brokers every day this week and today's no exception as Marc Haendle and Rainer Wilhelm send news that they've jointly listed the 28.33m pedigree sailing yacht Cyclos II for sale. Built by Royal Huisman in 1984 as a world cruiser to a design by Sparkman & Stephens, Cyclos II had an extensive refit in 2003. A refined interior by Pieter Beeldsnijder in blonde teak, high quality upholstery and fine fabrics accommodates up to six guests in three staterooms. With a range of 1,700 nautical miles at eight knots when under power, she's proved her worth at cruising the world with minimal crew. 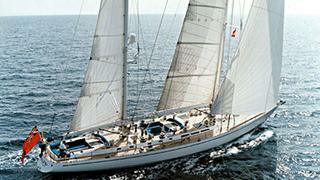 Lying in Palma de Mallorca, Cyclos II is asking €1.95 million.